You’ve gotten your first draft onto paper, but it doesn’t look anything like the novel you envisioned. Somewhere along the way, it took on a life of its own. It became grotesque: overblown, disorganized, and rife with inconsistencies. Your writing is flat, your characters are boring, and your plot contains so many dead ends it resembles a maze for some masochistic lab rat. Somehow it got so out of control that you can’t imagine now how to rein it in. While this article doesn’t address all of these problems, it will answer this question: What now? 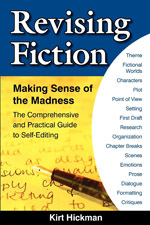 Before you examine the structure of your scenes or the tautness of your narrative style (see “Revising Fiction: Ten Tips To Tighten Your Narrative Style“), you’ve got to tame the monster you’ve created. You’ve got to trim the fat and organize the rest. Each scene must have a purpose; it must advance the plot or develop character (preferably both). Any scene that doesn’t is either a digression or it just conveys information. Delete it. Find another way to provide the necessary information. Make a note on the card of any scene you plan to move information to. Ideally, each scene that you keep should also show conflict between characters, create suspense, and show how the day-to-day life in your world is different from your reader’s life. Jot down ideas to enhance these characteristics of each scene. Is the scene an action scene? A romance scene? A dialogue scene? Something else? Write it on the card. Don’t string too many action scenes in a row. You want to excite your reader, not fatigue him. Similarly, don’t put several passive scenes together; you’ll risk boring your reader. Color-code the title row of your scene cards with highlighter markers (pink for action scenes, yellow for passive, orange for others) and lay the cards out on a table with the highlighted title showing. This will give you a good visual display of the distribution of the action. Look for scenes that you can move to create a better balance. As you wrote your first draft you may have made decisions that created inconsistencies in your characters or plot. If so, decide how best to resolve them, and in which scenes. Note any necessary changes on your scene cards. A suspense element is any question you’ve raised in your reader’s mind, any loose end you need to tie up in another scene. On your scene cards, note the suspense elements you introduced or resolved in each scene. Then go back through the cards. On a separate sheet of paper, list each suspense element. Next to it, write down the number of the scene in which you introduced it and the number of the scene in which you resolved it. Did you resolve them all? If not, tie up each loose end. Either find a scene in which to resolve it, or don’t bring it up in the first place. Make notes on the appropriate scene cards. Before you rewrite your scenes, save your manuscript and begin working on a separate draft. If you decide later that you need something you’ve altered or deleted, you’ll be able to retrieve the original. During this rewrite, you’ll throw whole scenes away, write new scenes, and revise some so extensively you’ll have to start them over from scratch. Every scene will need some form of revision. Don’t let this discourage you. You must trim the fat from your first draft and bolster the weak or missing elements. You already know what changes you need to make; you’ve noted them on your scene cards. Now rewrite each scene using these notes as your guide. When you’re done, review your notes to make sure you didn’t miss anything. Now your manuscript is ready for the more detailed editing required to clean up your scene structure, narrative style, and dialog. Those topics, however, I’ll leave for future articles. This article was originally published in the March 2009 issue of SouthWest Sage, and is reprinted here by permission of the author.